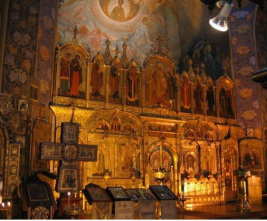 CONSIDERING CONVERSION TO EASTERN ORTHODOXY? The purpose of this blog is to offer critical insight into some lesser known sides of Eastern Orthodoxy, and, if you are a seeker who is considering becoming Eastern Orthodox, help you make an informed decision about weather you should join this body. Please read this thoroughly, and, if it’s not inconvenient, let me know what your thoughts are. You can do so by clicking here. If you already consider yourself to be Eastern Orthodox, I would recommend read this article first. Who am I, and what are my qualifications? My name is Alex Jovanovic, and I am an Evangelical Christian, although I was formerly Eastern Orthodox. I’m an American who was born and raised in Serbia, a country with a strong EO majority (abbreviation EO will be used for Eastern Orthodoxy from now on). Growing up in Serbia I displayed an above average interest in the faith of my ancestors, and immersed myself into the EO teaching and practice. I was baptized, attended Sunday school classes, served as an acolyte, toured numerous monasteries and bought and read many books on the topic of EO. I even aspired to become a priest at one time. Today, as an Evangelical Christian I'm a lay preacher, I conduct Bible studies, and I spend most my free time studying the Bible and Church history and doing online ministry in Serbian and Croatian. All in all, I feel like I have a decent amount of knowledge and experience to weigh in on the matter. Since I've moved to the US, I noticed that a moderate number of people covert to EO, and frankly, that intrigued me, as I've always been thankful I escaped it. But, having spent close to a decade in the US, I can understand what the appeal of EO for a Western Christian is. One of the things I noticed is that those who convert usually already consider themselves to be Christians of some other denomination (of course, there are those who convert when they marry an EO person, but I would not count those as serious converts). Certain Protestants and Roman Catholics simply get disappointed and disillusioned by some things in their denominations. Some Protestants are put off by the over-saturation of “modernity” that their church had succumbed to. They don’t care for that laser show on the podium, the rock-concert type worship, or being “cool” in general by pandering to every trend that comes along. They lament the loss of structure in services. Others are sickened by the intrusion of liberalism in their denominations. Still others are bitter about the fact that supposedly some 30,000 different Protestant denominations exist, and they keep multiplying! They crave the formal Church unity, and are sick of divisions inside the Body of Christ. Again, they would appreciate a more formal structure, not just in the services, but in the organization as well. They are leery of switching to Roman Catholicism, as they have issues with certain Roman Catholic doctrines, like papal infallibility, for example. Some Roman Catholics are disappointed with certain practices they come across in their fellowship, but do not want to become Protestant either, so EO seems like a reasonable solution. Finally, there are folks who discover EO by studying church history, and are intrigued by its connection to the early Church fathers. The above mentioned groups are delighted to find EO - the “hidden gem” of Christianity. 1. EO has apostolic succession – and it’s not Roman Catholic! Protestants who are looking for a church with formal apostolic succession, and refuse to look into Roman Catholicism, are simply ecstatic to discover that such a church even exists, especially since it’s so unknown in the West. Apostolic succession means that the church has an unbroken chain of ministry ordinations, dating to the time of the apostles themselves. The Roman Catholic Church has this as well, but it's unappealing for different reasons. 2. EO has preserved the teachings of the post-apostolic fathers. EO's claim to fame is its unwavering faithfulness to the works of all major ancient and medieval theologians. This gives the impression of EO being the true, continuous, uninterrupted institution of Christian faith - the embodiment of the very Church that the Christ himself had established. 3. EO church ambiance is enchanting. It’s hard not to be impressed with the fact that this body preserves so many ancient and medieval traditions. The interior design of an EO church is usually radically different from that of a typical Western church. The darkened, quiet environment, the smell of wax candles and incense, the color and style of ancient iconography and many other details make one feel that he stepped several centuries back in time. It's understandable how one can truly feel that they came to a place of spiritual peace, as it’s indisputably different from the noise and business experienced in our daily lives, and sometimes even inside the Evangelical churches themselves. 4. EO is very structured in both its services and organization. For those who are craving structure, this is a dream come true. EO has an extensive list of rules and regulations that sometimes guide the smallest details of church life. While the above is by no means a definitive list, I believe that it gives an accurate portrayal of what attracts most converts. I will, however, not be addressing these points in this blog. What I would like to do is make you aware of certain EO teachings, beliefs and practices that will probably not be immediately disclosed to you by your local priest, and hope to help you see EO for what it truly is. Let's explore some of those things. Click the button below to access the article list.